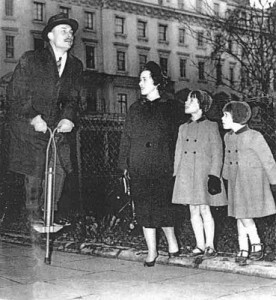 Yesterday evening, Radio 4’s Four Thought – which you can listen to here – featured a lecture about a teenager from Hull who back in 2003 had taken to writing to politicians to ask them if they had ever been on a pogo stick or space hopper. As I explained in the lecture, ‘Jason Whiley’ never really existed – him and his letter having been dreamt up one night in the pub. But the replies he got from politicians were all genuine: his (appalling written and frankly moronic) enquiry produced more than 80, including from 27 Cabinet Ministers, four Prime Ministers, three Chancellors of the Exchequer and two European Commissioners, many of whom also enclosed pictures of themselves. ‘Jason’ used the replies to create a website, called Statesman or Skatesman, which back in 2003 attracted widespread coverage, from the BBC to the Stuttgarter Zeitung to the Times Education Supplement. ‘Occasionally’, as the TES put it, ‘a pupil comes along who has just a bit more spark than average’. Part of the reason I agreed to give the lecture, and to ‘out’ Jason, was to make a (small) apology to all those who replied – many of whom were busy enough responding to real enquiries from constituents without having to deal with fictitious ones from imaginary teenagers. But I also wanted to explore quite why so many did reply. Part of the explanation is simply that MPs are more ready to do this kind of thing than they used to be. In an era when we talk a lot about the political class being increasingly remote and detached, it’s unfashionable to claim it, but all the evidence is that MPs today are much more in touch with their constituents than they were 40 or 50 years ago. There is the famous story of the MP who arrived at his constituency in 1945 to be asked by the top-hatted stationmaster if that would always be the date of his annual visit. There are no MPs today who take such a detached view of constituency work – and any who tried would not last very long. MPs are now increasingly likely to live in the constituency, to come from the constituency, to have offices in their constituency and to spend more and more of their time working in or for the constituency. A study by the Hansard Society into the behaviour of the 2005 Commons intake found that constituency work was on average taking up more than half of the time of an MP. Their central or primary role — or at least the main draw on their time and energies — was no longer at Westminster but in the constituency. In other words, I suspect that any imaginary Jason Whiley who’d tried a similar exercise in 1953 would have got a much less enthusiastic response than the one in 2003 – simply because MPs then were not so used to replying to letters. The public should be pleased by this, because surveys of voters show that they rank constituency work as the number one priority for MPs – looking after their constituents is exactly what the public think MPs should be doing. Yet there must now be a real concern that MPs are so focused on the parochial they have no time for the national, let alone the international, picture. One MP who responded to the Hansard survey spent 97% of their time working on the constituency, which suggests that they were not a terribly effective MP in the remaining 3%. There is a real danger that MPs spend so long sorting out Mrs Miggins’ pension problems that they don’t spend long enough scrutinizing the Pension Bill – with the result that millions of future Mrs Miggins’ will suffer. The problem MPs face is that voters want, and expect this relationship with them; and any MP in a marginal seat who decided to make a virtue of prioritising Westminster over the constituency would soon find that the voters had different priorities. But it is possible simultaneously to value the constituency link – the link between representative and represented – and still think that this has grown out of all proportion. Many MPs enjoy their constituency work – they find it satisfying, and a good way of keeping in touch – but some will privately admit that they think it has now got out of hand. In other words, perhaps it would have been better if more MPs had simply dumped Jason’s letter in the bin. Previous Post Bastards or B’stards? Next Post The (political) madness of art? Listened to it on my way home last night and found it tremendously enjoyable. Personally, I thought it made our MPs appear much more human and disagree with his own conclusion. A lovely radio programme nevertheless. I guess that explains why ‘Jason Whiley’ ended up failing his Politics A level.